I’m very pleased to announce the immediate availability of Yoink v2.0 for iPad and iPhone. 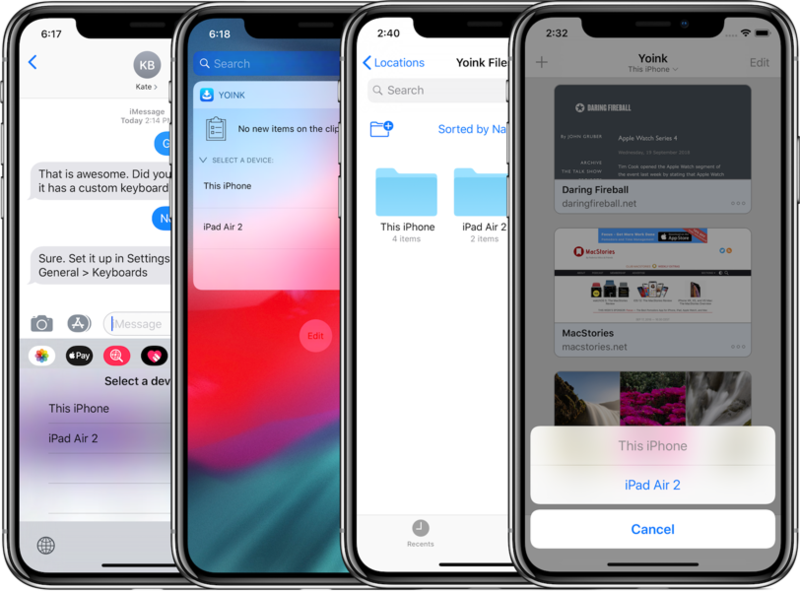 It’s a a free upgrade for everyone who’s purchased before and has a lot of great, new features, like iCloud Sync, Handoff and Siri Shortcuts. – Yoink’s Share/Action extension shows up in almost any share sheet. So, now that you’ve got all your files in Yoink, how can you get it out again? – Yoink’s keyboard: Wherever you’re editing text, Yoink is right there with you – in the form of a keyboard. On iPad, drag and drop items out to where you’d like them in your text; on iPhone tap to copy items. What’s New in Yoink v2.0? 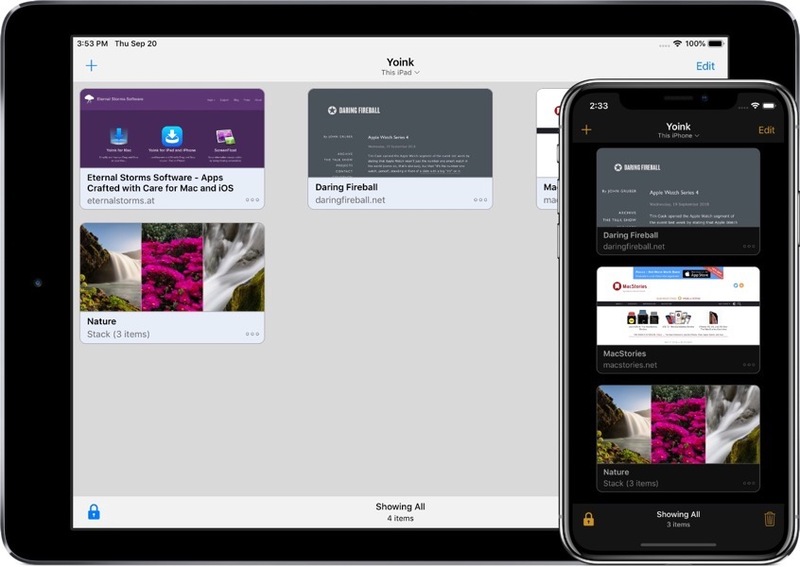 Yoink syncs your items across all your iOS devices using iCloud (Mac sync will follow at a later date). Each device has its own “shelf” in Yoink, neatly grouping items together so you’ll always know where to find them. Not only are synced files accessible via Yoink itself, but all relevant extensions as well: the keyboard, the today widget, Spotlight and the File provider. 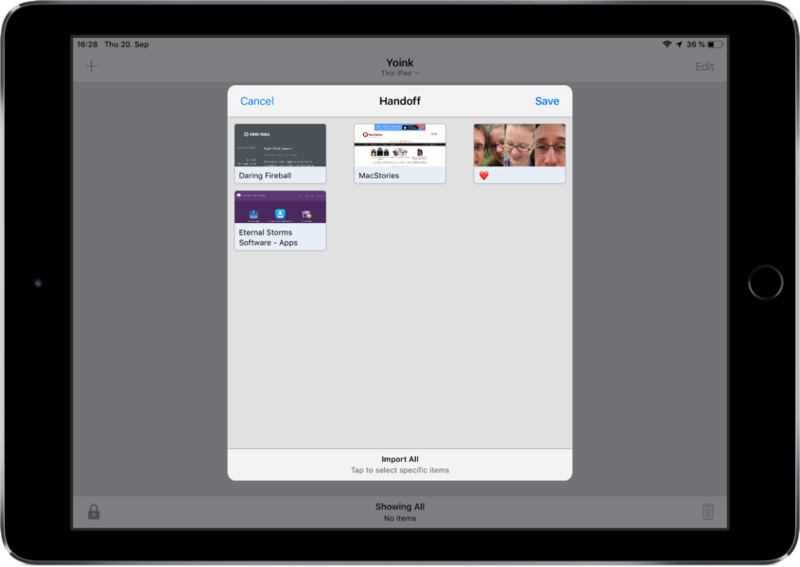 Transfer files between your iPads, iPhones and Macs (separate Yoink for Mac app v3.5 required) using Handoff. When files are selected on the sending device, those are transmitted. If no selection is made, you’ll be able to select on the receiving device. Using Siri on iOS 12, you can store your clipboard’s contents or download the link on your clipboard in Yoink, all without having to switch-to or activate Yoink. You can also copy files from Yoink, for instance, the most recently added image, PDF, text or weblink. Lastly, you can tell open to show you a specific sync’ed device with a simple voice command. Yoink can now be almost completely controlled by external keyboards. Selecting items, viewing their contents, searching, copying, pasting can all be done without you having to touch your screen. Yoink can now be used in a beautiful dark mode. You can also set it up to use smaller icons, so you can show more files at once. There are lots of other improvements and bug fixes, like being able to edit text right from Yoink, improved download notifications, better and more efficient icon creation and Spotlight indexing, support for universal links or in-app search. Basically, not one part of Yoink has gone unimproved. It uses less memory and has become more responsive and reliable. Yoink requires an iPad or iPhone that runs iOS 11 or newer. It’s available in English, German, Japanese, Simplified Chinese and Korean. More languages will follow.